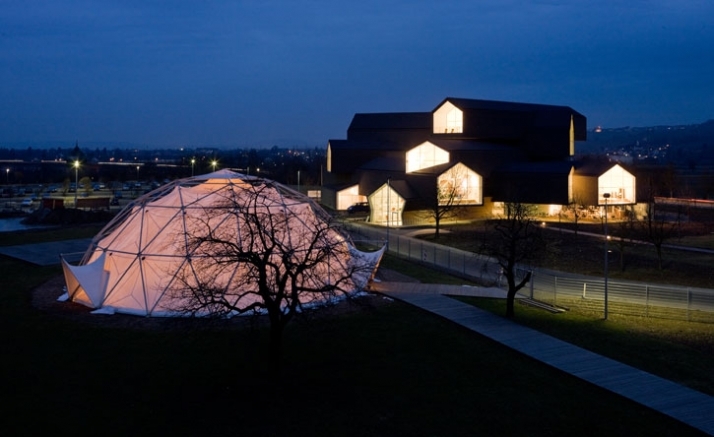 Standing beside the Vitra Design Museum by Frank Gehry (1989) and the Conference Pavilion by Tadao Ando (1993) VitraHaus in Weil am Rhein, by Herzog & de Meuron (2010) connects the two buildings. The concept behind its design connects two themes which appear in the work of Herzog & de Meuron; the stacked volumes and the typical house figure which we drew as kids. The entire concept and the primary purpose behind the design of this five-storey building is the presentation of Vitra furniture and objects for the home as if they are in your home. The showrooms proportions and dimensions are very human like and very familiar as the VitraHaus is very similar to a residential setting – the architects prefer to use the term ‘domestic scale’ to describe the case. Despite the showroom appearance, the interiors have turned out to be very cozy and welcoming. Despite their somewhat chaotic appearance the exterior gable portions of the building protrude of the stacked volumes to portray the individual houses. The five-story and in some cases fifteen meter high building which is composed of twelve houses, intersect like building blocks which are trying to balance in this three-dimensional composition. The gable walls have been glazed with charcoal color stucco which unifies it with the surrounding setting. 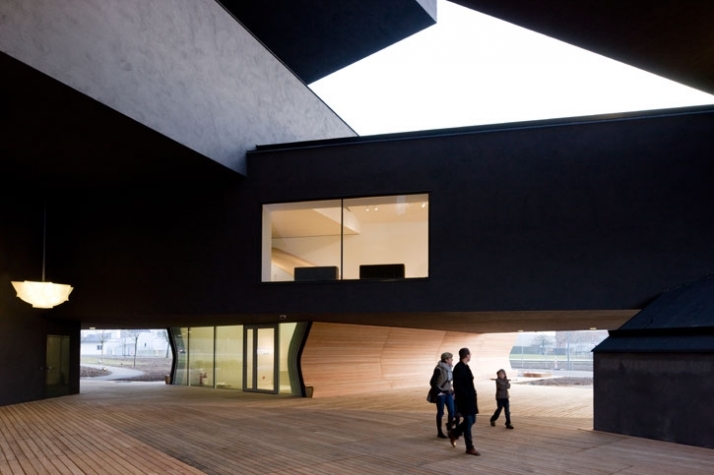 The light color wooden plank floor contrasts the buildings boundaries and makes a clear sense of where the five main buildings which hold the rest of the building blocks begin and where they end. 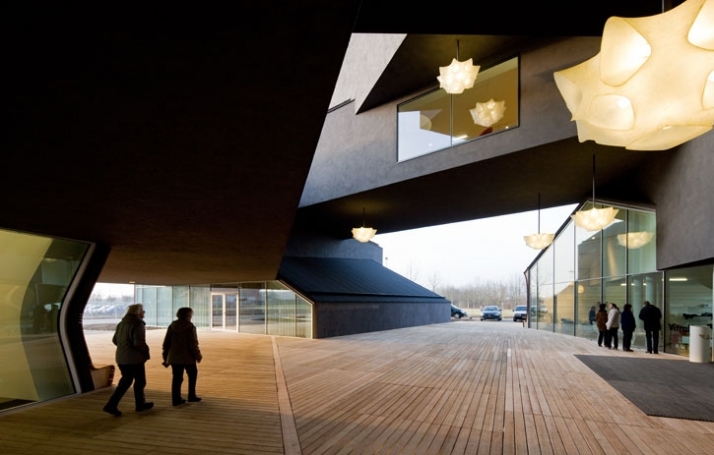 The five buildings include a conference area, an exhibition space for the chair collection of the Vitra Design Museum and a conglomerate comprising the Vitra Design Museum Shop, the lobby with a reception area and cloakroom, and a café with an outdoor terrace for summer use. To visit the exhibition space a lift takes the visitors from the entrance to the fourth floor where their circular tour begins. The floor plan and the orientation of the buildings are arranged in such a way to offer spectacular views throughout the walk around. 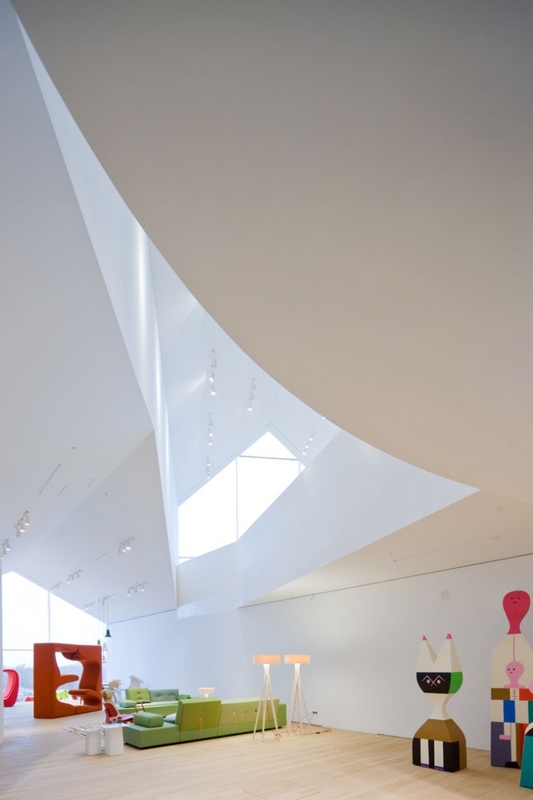 The complexity of the interior space arises not only from the angular intersection of the buildings exterior but also from the amalgamation of a second concept within the building. 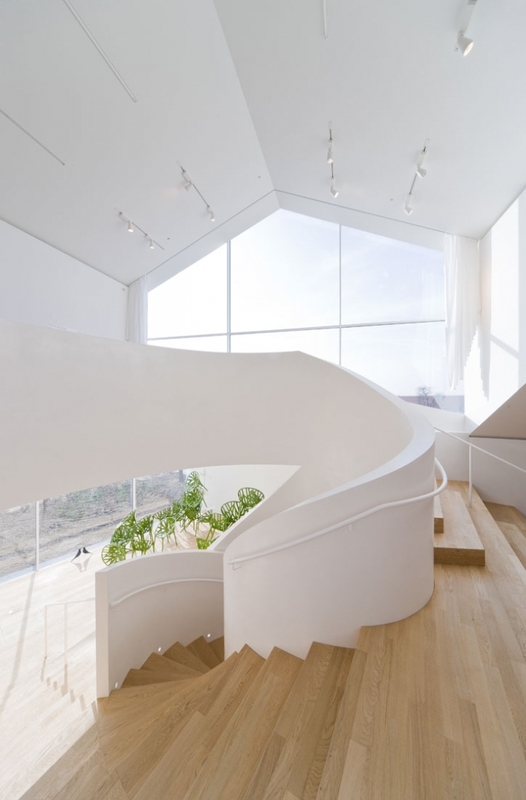 Despite the exterior linear approach of architectural design the interior has a softer form a rather organic approach. 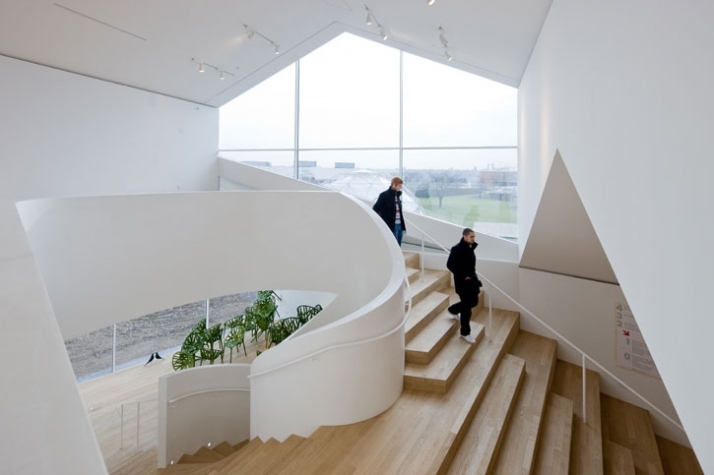 The staircases are integrated in an unrestrained twirling organic volume that symbolically unfolds itself throughout the various levels of the building in a worm-like manner. The captivating worm-like structure sometimes reveals fascinating views of the visual relationship (interconnection) of the block houses and at other times it blocks the view. The interior space includes hardwood oak floors while the walls are finished in a cool white color as they intend to give priority to the displays than to the walls; the approach is very gallery-like. Apart from the display, VitraHaus offers insights into production methods and quality control. 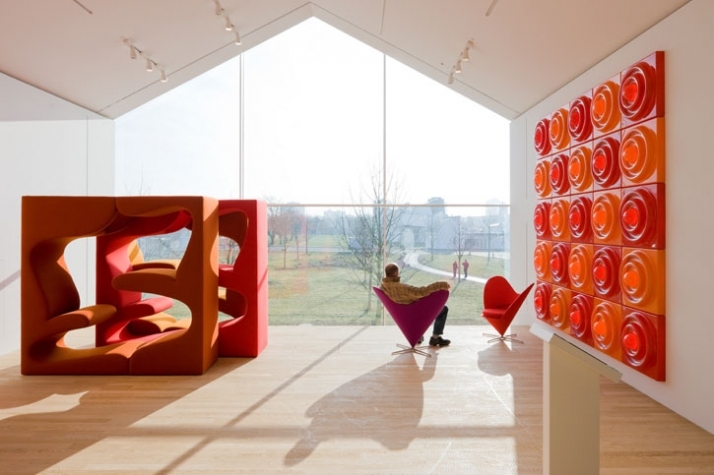 It demonstrates Vitra's commitment to sustainability and illuminates the world of work and office chairs. A color laboratory aids visitors in the choice of suitable colors. 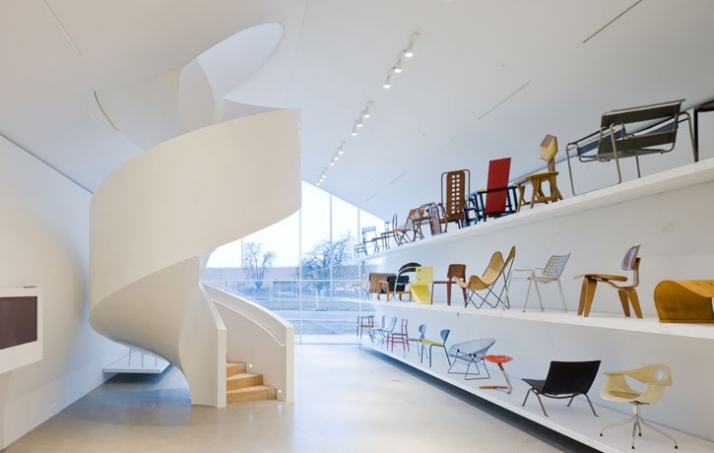 The "Vitrine" in the VitraHaus shows a selection of chair designs from the nineteenth and twentieth centuries, thereby giving a view of the extensive holdings in the Vitra Design Museum Collection. However, what I find most fascinating is the element of the reversed perspective that VitraHaus has. The building has a daytime and a night time view. 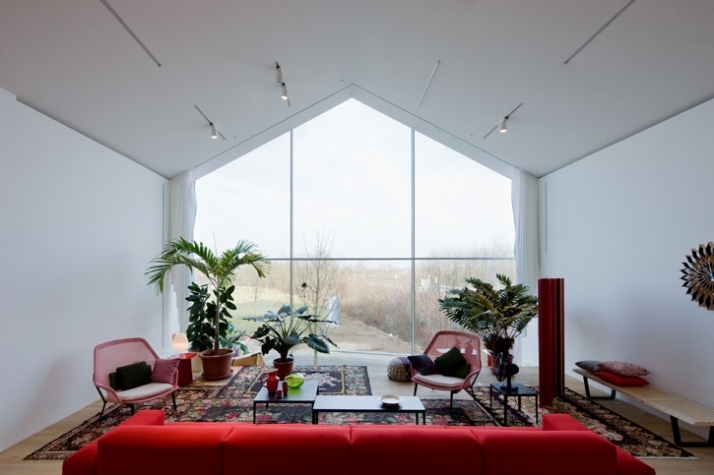 During the day, one can gaze from the VitraHaus outwards while when the night falls the illuminated interior allows for uninterrupted views from the exterior into the interior. 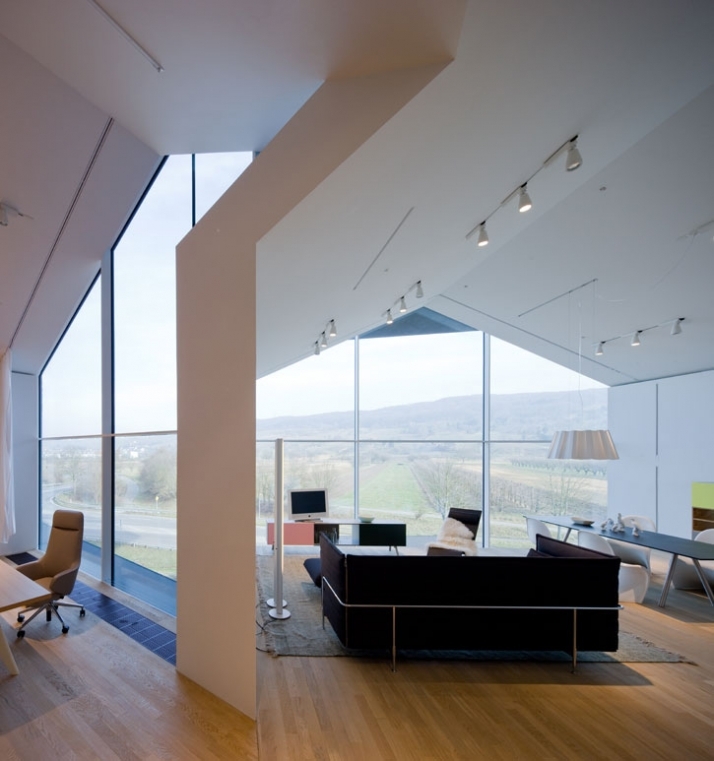 The interior lies before the eyes of the Vitra Campus and the countryside of Weil am Rhein. 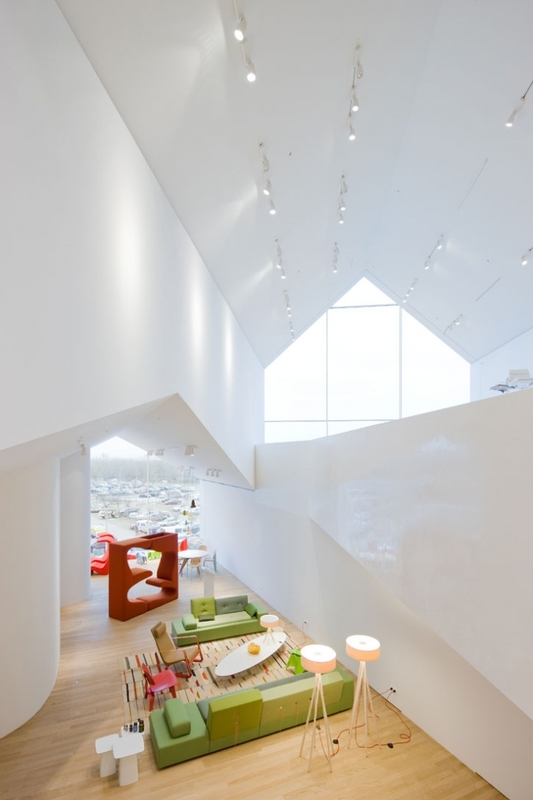 VitraHaus invites visitors to explore, define and refine their sense of design. A visit to the VitraHaus is like taking a trip through design history, but it also offers the opportunity to encounter the work of leading contemporary designers. 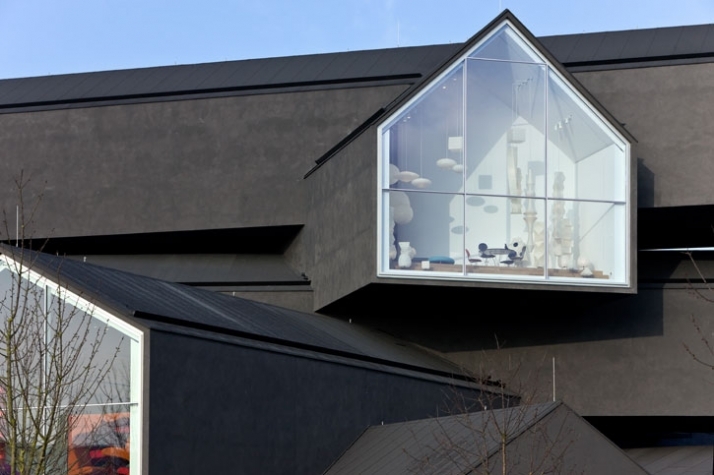 For those interested to visit, the VitraHaus is open Monday to Sunday from 10 am to 6 pm.